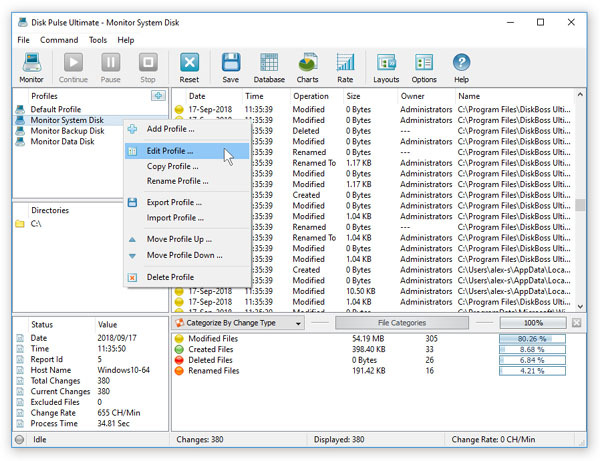 In order to simplify monitoring of multiple disks or directories using customized sets of parameters, DiskPulse provides the user with the ability save a number of profiles and specify pre-defined directories to process and configuration options for each of them. The simplest way to add a new disk change monitoring profile is to press the 'Add' button located in the top-right corner of the profiles view. The DiskPulse GUI application allows one to add new profiles, edit profiles, export/import profiles and delete profiles. In addition, the user is profiled with the ability to associate a keyboard shortcut with each user-defined profile. Finally, DiskPulse allows one to create a direct desktop shortcut for each profile, which may be used to start monitoring operations in a single mouse click. In order to edit a disk monitoring profile, select the profile item in the profiles view, press the right mouse button and select the 'Edit Profile' menu item. Select a profile item, press the right mouse button and select the 'Delete Profile' menu item to delete the profile from the product configuration. All the user-defined profiles listed in the profiles view are stored in the user-specific product configuration file, which may be exported for backup purposes and later used to restore the product configuration on the same or another computer.